Heves county, whose main town is Eger, is geographically diverse, with the M�tra and B�kk mountain ranges up north, and the Great Hungarian Plain down south. Heves's climate is relatively ool. The highest point in Hungary is located in M�tra - the 1024 meter high K�kes Mountain. Lake Tisza is here as well, the largest artificial lake in Hungary. Eger is a city of healing and thermal waters, wine and of history, as well as a city of students. 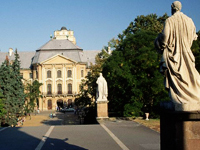 The neoclassical Cathedral of Eger was built to plans by J�zsef Hild. Opposite is the Lyceum, now a secondary school for girls, a building noted for its baroque style with rococo details, which preserves numerous historical manuscripts, codices and letters. It also includes a 53m tower, and a working observatory open to the public. In downtown Eger there's another baroque treasure - the Castle of Eger, which has a Turkish bath and a 40-metre high minaret, the highest Turkish monument in Hungary. Historically famous for a defence by 2,000 men against an attack by 80,000 Turkish soldiers, the castle's defendants believed that they drew their fighting strength from drinking bull's blood. Today, Eger and the nearby area of Sz�passzonyv�lgy (also known as the valley of beautiful women) are wine regions, producing spicy wines; Eger Bull's Blood (bikav�r), Eger le�nyka, and Medina. Eger today is a popular tourist destination with a charming Baroque town centre.� Many buildings in Eger were built by Jakab Fellner, perhaps Hungary's most significant baroque architect, including the Primate's palace, the Lyceum, and the "Nagypr�posti" Palace. Other places of interest in Heves county include the preserved Cistercian abbey in B�lap�tfalva. The abbey, Nagyboldogasszony, is a beautiful blend of Romanesque and Gothic elements - seen in its arched and rosetted buildings and gates. Those looking to commune with nature can make their way to B�kk National Park or the M�tra Landscape Protection Area (M�trai T�jv�delmi K�rzet) or enjoy the natural beauty of the valley of Szalajka and the F�tyol waterfall.